Volunteer service comes in many shapes and sizes, from painting classrooms to assembling student math kits to consulting with nonprofits to build capacity and reduce costs. 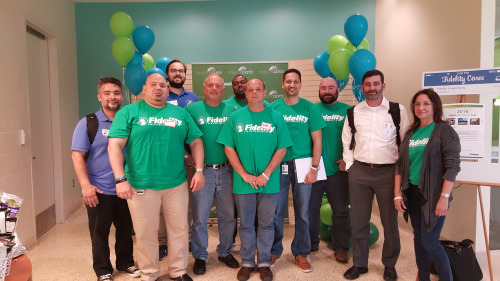 On May 4, while thousands of volunteers were participating in service projects across the globe as part of Fidelity Cares Day, more than 90 technologists in Westlake leveraged their professional skills – through something called skills-based volunteering – to consult in small teams with 11 local nonprofits to provide technology recommendations. The five-hour “blitz,” called Technology Impact Day, was presented in partnership with the nonprofit organization Common Impact and was the first of its kind at Fidelity. The event had a similar look and feel to a hack-a-thon, during which technology volunteers and nonprofit organizations gathered to discuss and solve a problem in a short time frame. Projects ranged from recommendations to improve website user experience to providing a road map to enhance mobile app security to assisting with database vendor recommendations. The nonprofit organizations who participated in Technology Impact Day found the process to be a valuable one. Survey results showed that 100% of the responding nonprofit organizations said the work accomplished during Technology Impact Day made a real difference to their organizations. “In 1.5 hours this Fidelity team solved what we had been working on for four years,” said one nonprofit participant. The initiative also benefited employees, who used their skills in a new way, connected with colleagues and made a difference in their communities. Below is an interview with two Technology Impact Day team captains, Bruce and Greg. Why did you volunteer for Technology Impact Day? Bruce: I was asked if I was interested in providing my expertise in leading a small onsite team to assist a nonprofit organization in meeting a unique technology challenge. I wanted to actually make a difference. This gave me a chance to do that. What did you get, personally or professionally, out of Technology Impact Day? Bruce: I came to appreciate the work that Boys and Girls Club of Fort Worth perform for children needing their services given both the resource and financial constraints they face. It was also an opportunity to get to know my team members better, both professionally and personally. The array of knowledge within the team was very impressive and everyone contributed some great ideas. Greg: I was impressed that our technology and finance experts could quickly adapt to a situation and provide thoughtful insights. The teamwork was inspiring! Bruce: I would highly recommend this, as we don’t often realize how fortunate we are and that there are plenty of people who can benefit from our expertise and assistance. What reaction did the nonprofit have to the team’s work? Bruce: I think it was an eye-opening experience for them. While they were aware of some of the gaps, the recommendations we made were both impactful and in areas that could be quickly implemented with ease. I feel like they thoroughly valued the time spent with our internal team.